New Delhi: Hero MotoCorp Ltd will pare capital expenditure by a third to Rs600 crore in the current fiscal, in an indication that the company expects a slowdown in sales. “The capex for this fiscal will be around Rs600 crore as the expenditure on the new plant will be coming in the next fiscal," chief financial officer Ravi Sud said in a conference call with investors on Wednesday. “This amount will be spent mostly on capacity expansion and R&D (research and development) activities." India’s biggest motorcycle maker had in June said it has set aside ₹ 900 crore for capex for the year ending March 2012, out of which it would spend some ₹ 500 crore in building a fourth factory with a capacity to produce 750,000 units a year. Hero now expects the fourth plant to start operation in the second half of the next fiscal, Sud said. The firm will expand capacity to 7 million units in the current financial year from 5.4 million, mainly by expanding its facility at Haridwar in Uttarakhand and making it more efficient. “With such kind of capacity, the company does not require another plant in the immediate future as its target for this fiscal is only 6 million units," said Ajay Shethiya, an analyst with local brokerage Centrum Broking. In the six months to September this year, the company sold 3.07 million vehicles. It had sold 2.9 million units in the same period last year, of a total of 5.4 million sold in the entire fiscal. To achieve its target of six million units and the balance of 2.93 million units, it only needs sales to grow 2% over last year in the rest of the fiscal. The company on Tuesday posted a record net profit of ₹ 580 crore in the fiscal second quarter. 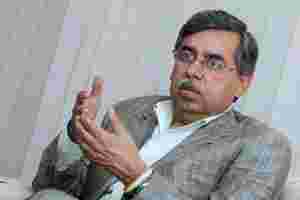 Managing director and chief executive officer Pawan Munjal said on Tuesday that inflation and rising fuel costs may adversely affect consumer spending in coming months. Hero MotoCorp sells every second motorcycle bought in the country. The two-wheeler industry is set to grow at a rate of 13-15% in the current fiscal year, according to an estimate by industry lobby group Society of Indian Automobile Manufacturers. In the investors call, the company said its royalty payment to Honda Motor Co. has gone up to Rs207 crore compared with Rs180 crore paid in the quarter ended 30 June, which was largely because the yen rose by 10% against the US dollar. “It is surprising that they did not expect the yen to appreciate. They are open and not hedged," said Mahantesh Sabarad, auto analyst at Fortune Equity Brokers Pvt. Ltd. “It has caught many companies off-guard." The Hero scrip rose 4.13% at ₹ 2,067 on the Bombay Stock Exchange on Wednesday; the benchmark Sensex index gained 2.01% to 17,085 points.